Three NA members sworn-in, not eligible to cast vote in presidential election - Integration Through Media ....! KATHMANDU: Three National Assembly (NA) members nominated by President Bidya Devi Bhandari took oath of office and secrecy today. NA senior-most member Tara Devi Bhatta administered oath of office and secrecy toDr Yubraj Khatiwada, Ram Narayan Bidari and Dr Bimala Poudyal at the Federal Parliament Building. Earlier, the three members had not taken oath of office and secrecy at a swearing-in ceremony of the NA members organised on March 4 after the Supreme Court had issued an interim order staying their oath. They took the oath of office and secrecy today after a division bench comprising judges Kedar Prasad Chalise and Sarada Prasad Ghimire on March 7 scraped the interlocutory order issued by the SC, paving the way for the swearing-in of Khatiwada, Bidari and Poudyal. 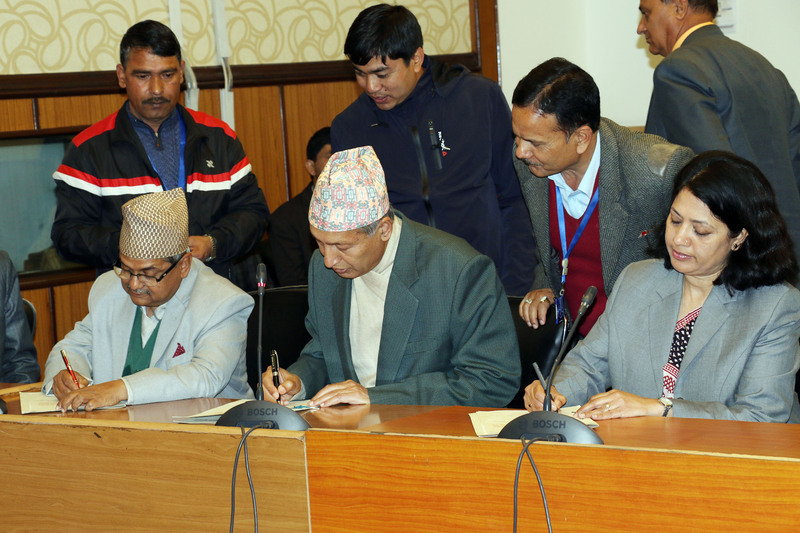 Gopal Basnet, Krishna Prasad Poudel and Chandani Joshi, nominated on February 9 as the National Assembly members by the erstwhile government led by Nepali Congress President Sher Bahadur Deuba had filed a writ petition, naming the Office of the President, and Office of the Prime Minister and Council of Ministers as defendants, saying their nomination was not unconstitutional. The KP Sharma Oli-led government on February 20 had recommended the names of Dr Khatiwada, Bidari and Dr Poudyal to the three NA seats after withdrawing the recommendations made by the previous government. The President nominated Dr Khatiwada, Bidari and Dr Poudyal to the post on the same day. Although Dr Khatiwada, Bidari and Dr Poudyal took the oath of office and secrecy, they could not cast vote in the Presidential election set for March 13 as the Election Commission has already published the final name list of voters on March 6 in this connection. There are 880 NA members, members of House of Representatives and provincial Assemblies are the voters in the presidential election. Names of three NA members nominated by the President on the recommendation of the government and Rajeev Gurung, a member of House of Representatives, have not been included in the list of voters, so they are not eligible to take part in the voting, according to the EC. However, a meeting of the office-bearers of the EC has the right to make some decisions regarding removing hurdles in case of receiving information in writing from the Secretariat of Federal Parliament in this regard, said EC Spokesperson Nabaraj Dhakal.